This weekend was one of those that I like to define as a ‘fail’ weekend. It started off on Saturday morning. I was writing a grocery list at home, looking through the pantry first, then the fridge. As I open the fridge door, a bottle of red wine that usually sits on top of the fridge, fell off, down the back of the fridge, smashing. There was red wine and glass everywhere. Normally I would just swear a little, and then start cleaning. But behind the fridge? That’s one of the most disgusting places in my house. There is dust and bugs, and when mixed with glass and red wine it becomes particularly annoying to clean. I stood still for a while looking at the mess, contemplating how I was going to clean it. I could barely move the fridge forward because glass was getting stuck in the little wheels. The smell was another thing –after an hour cleaning, woo, needed to go outside for a breather! The rest of the day was like this too, one fail after another. The only non fail of Saturday was my soup. 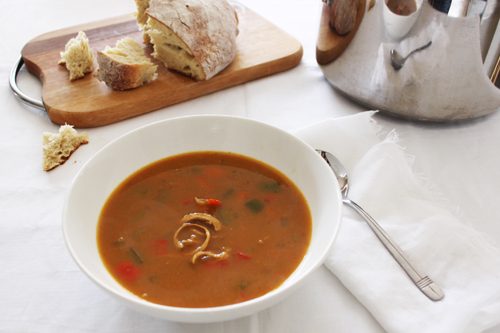 I don’t think soup can ever be a fail – there’s something so simple and calming about it. This soup was inspired by my recent trip to Melbourne, where on a cold afternoon at 3pm the only thing I felt like was soup. There’s this awesome soup kitchen on Degraves that I love, and it was there I tried their Chicken Curry Soup. Taking notes as I was eating it, I realised this wouldn’t be so hard to make myself. So Sunday lunch, just before setting off to watch the Eagles and Dockers game, I ate a big bowl of soup with some fresh bread. I have amended the recipe slightly to the one I made, only because I felt the soup didn’t need curry powder. I also pre-cooked the chicken completely, but I think you could just poach it in the soup. I used the chicken stock from my Chinese Chicken Stock recipe that I had frozen. You can use any stock made from scatch or just used a stock bought stock. In a large pot on a medium heat, add a splash of oil and cook the chicken breast enough to seal the outside and add a bit of colour. Remove the chicken from the pot, then add the spices and onion, and cook until fragrant. Add the diced celery, carrot, capsicum and zucchini, and stir to coat the vegetables in the spices. Add the stock and bring to the boil then reduce to a simmer and place the chicken back in the pot. Add a good seasoning of salt, then continue simmering for 1 hour. 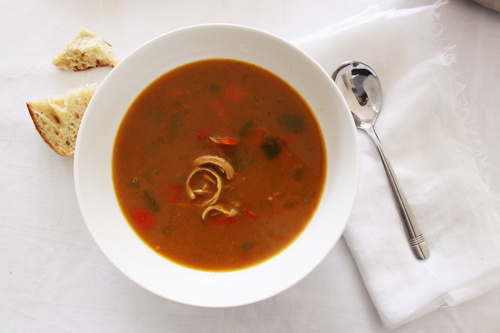 When the soup has become thick and the vegetables have cooked, remove the chicken bread and shred the meat. Take two cups of the soup and blend until smooth, then return to the pot, along with the shredded chicken. Give it a good stir, taste for seasoning, then serve.